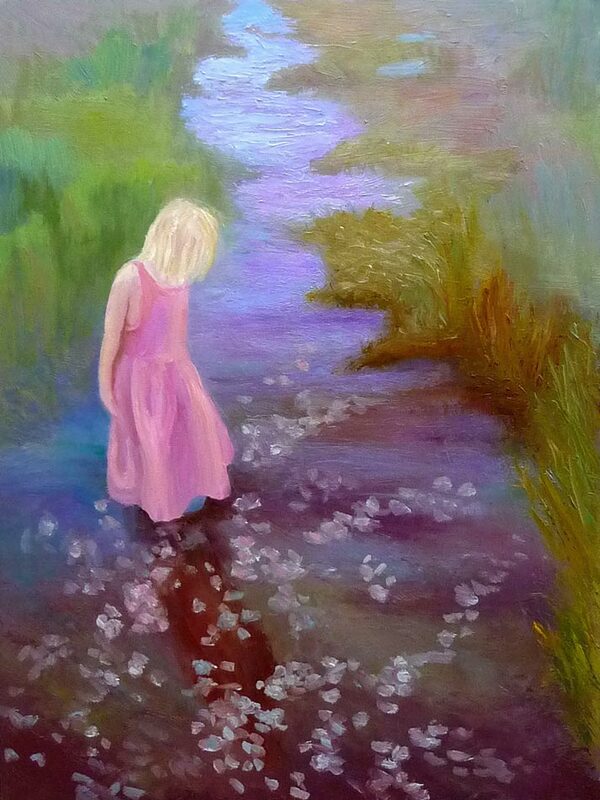 Hannah's Reflection, oil on Gessobord 12x16"
After I posted this painting a few weeks ago I realized I’d left off the foamy bubbles on top of the water. Last weekend I worked on the painting some more, at first planning to just add the bubbles but ended up adding a whole new layer of paint. I gave Hannah another haircut and slimmed down her dress a bit. I felt a little afraid to go back in and start messing with things, but told myself to just have fun and see what happens. I don’t think I quite got the essence of the foam, it looks more like rose petals floating on the surface, but I decided I liked that idea and left it alone. I’m wondering if there is a problem with the grasses behind the rust colored reeds on the middle right that sort of point towards her head. Should that patch of yellow-green grasses have less texture, be cooler and more blurry so that they recede more? I think so. I’m trying to get over the idea that paintings need to be completed in one painting session or in one day. Alla prima and plein air painting is great, but so is letting layers dry and adding more more until the painting says it’s done. Sometimes it forgets to say “When” though, and then it’s overdone. I have the same trouble with steaming vegetables. I lose my concentration and before I know it my broccoli has turned to mush. So is the revision mushy broccoli or an improvement? Do you think I should soften those grasses or move on? 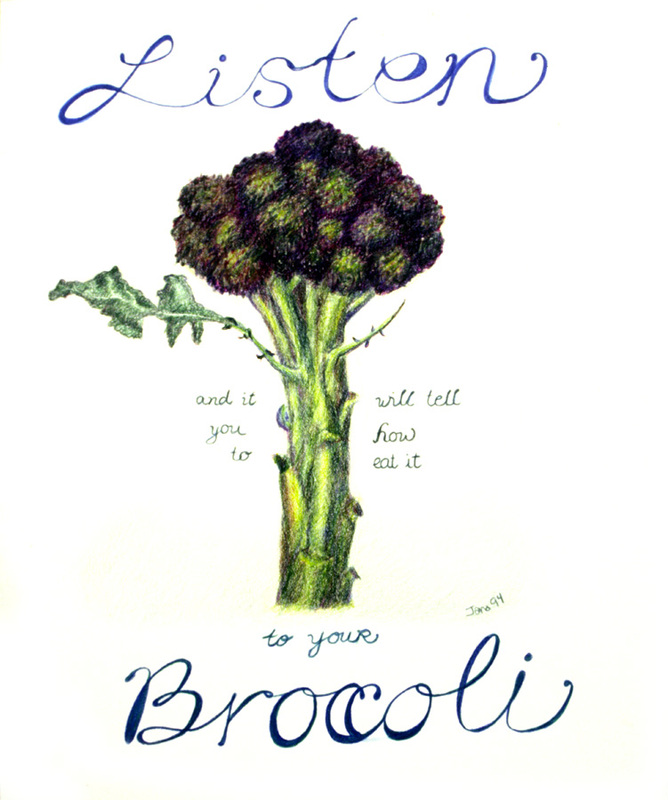 "Listen to Your Broccoli and It Will Tell You How to Eat It," Colored Pencil, 24x18"
Oooh! How I love this one!!!! The lay out, the colours, the theme, that character looking down, I like everything! It makes me ponder, and dream. It’s great! Thanks Cathy. How cool that my painting made you ponder and dream! That feels like success to me, so thank you very much! The revision is WONDERFUL! You added a lot of detail that makes much more sense (visually) of the whole scene. I especially appreciate the details added to the stream bed, the grasses and the foam / rose petals. 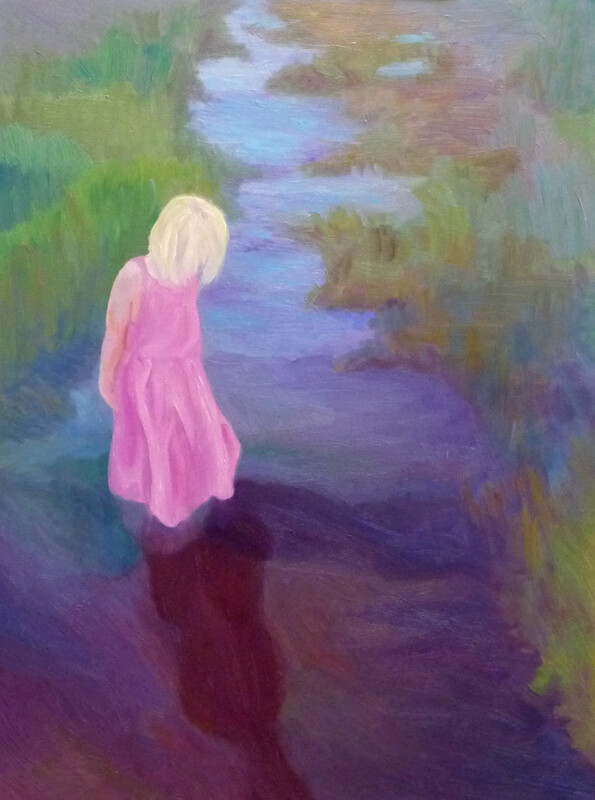 I think the added chromatic modeling (grasses, dress) also makes the painting stronger. Glad you had the courage to play with a ‘finished’ piece. Wow! I so appreciate your thoughtful and detailed message. It means so much that you took the time to write! I think the change is wonderful. It helps tie it together. And, no, it’s not overdone. And unlike broccoli you can savor it’s beauty for a long time without it spoiling. Hah! That’s true. Broccoli definitely doesn’t savor well for more than an hour or two! your revision makes me want to run through the painting trailing my fingers in the grass! somehow you managed to give the whole depth and texture without losing the dreamlike quality of the first draft. i am terrified of revision. and broccoli that is over cooked. this will give me courage. as always, i love your work and your brain. Thanks Gina. What a great image of you running through the painting! What beautiful depth in the revision. And with the reworking of the water we can share in her fascination and guess the reason she is looking down so intently at the water. Yes, this is a liovely painting and reworking it is fine. Oh broccoli is so good for you but you should never let it cook too long eh! Needs to be crunchy. Our mothers really overcooked vegies and now our daughters are eating food almost raw! Nice pic anyway. This is so lovely. Indeed a painting to set us dreaming as so many have said. Foam or petals–a lovley touch. Sorry, but as I scrolled down I was caught by the gorgeous broccoli. Can’t switch my mind off it now! What a beautiful piece! I think the revision makes it look complete — it was a bit unfinished looking in the first one! And that broccoli piece …. fantastic! I like it better now, too. I would keep going forward with new work! It is great to see you using your extensive knowledge of value and shape and so on in your oil painting now! !